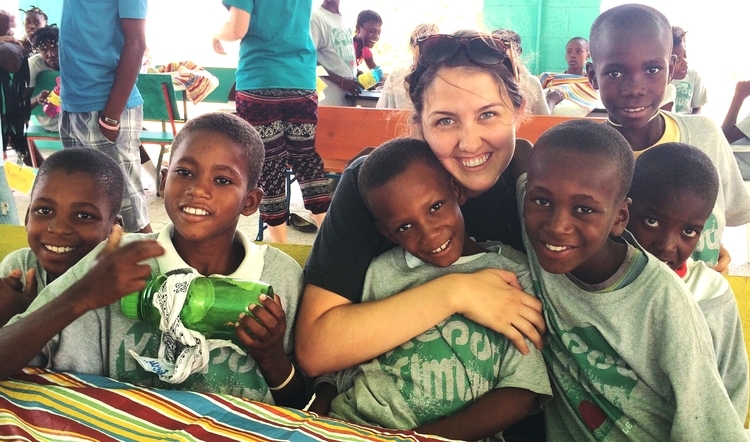 ACU graduate J’Lyn Emerson poses with children in Haiti, where she works with LiveBeyond. 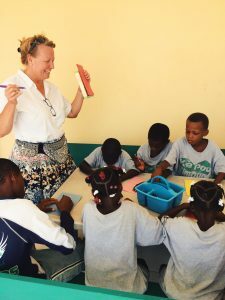 J’Lyn Emerson (’11) is marketing manager for LiveBeyond, a faith-based, humanitarian organization that brings medical and maternal health care, clean water, education, orphan care, community development and the gospel of Jesus Christ to the oppressed in Thomazeau, Haiti. The organization was founded and is operated by ACU graduates Dr. David (’82) and Laurie (Stallings ’81) Vanderpool. J’Lyn tells how the people of Haiti captured her heart. My first mission with LiveBeyond was in November 2013. I wasn’t expecting to fall in love with Haiti, and I certainly wasn’t expecting for it to turn my entire life upside down. But God had bigger plans for me than I had for myself. Funny how He always seems to works like that. I could go on and on about all “the feels” that I experienced during my first trip, but I’ll keep it short and simple. 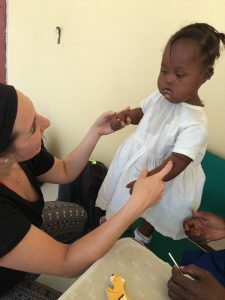 On my first day in Haiti, I knew that my life would never be the same. God shifted my heart 180 degrees – and that shift was directed towards His people – knowing that my life was never meant to be about me, but instead, it must be about serving those who cannot care for themselves and spreading the Gospel to a people desperate for His truth, hope and love. This October was my ninth trip with LiveBeyond. Over the past two years, I’ve been incredibly blessed to witness and be a part of the transformation that’s taking place in Thomazeau. And to say that God is working in extraordinary ways is the understatement of the century. I’ve witnessed our staffs’ hearts change from just doing their jobs to get paid to fulfilling God’s purpose for their lives through their jobs with LiveBeyond. I’ve seen babies born that I thought, “There’s no way she’s going to make it.” And a few months later I return, and the baby is healthy and growing because LiveBeyond provided medical care, medicine and formula for the child. 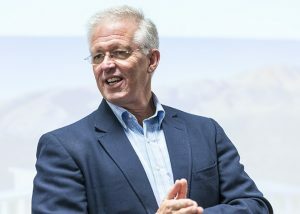 I’ve listened to the Vanderpools’ conversations about their dreams and what’s next for LiveBeyond – and I’ve seen those dreams come to fruition time and time again. One of those dreams was Kè Pou Timoun. If you look at the camera roll on my iPhone, you’re going to find hundreds of pictures of kids in our Kè Pou Timoun program. You might find some older pictures and think, “Why would she not delete that by now?” But the truth is that I simply cannot delete these memories or precious faces from my mind or phone. Because from trip to trip, I can visibly see God working and watch the change in these children’s lives unfold. I can see sparks of creativity behind Junior’s eyes when he picks up a crayon now. Before he didn’t even know how to hold it or what to do with it. I can see kids joyfully sing about what Jesus has done (and is doing!) in their life instead of being quiet bystanders during our church worship services. I can see our Kè Pou Timoun staff passionately tell Bible stories and teach the kids about God’s faithfulness and goodness – when at first, they weren’t sure what to think about leading this new program. This list could go on forever. But I want this post to be a reminder that there is still so much more to do. I’m guilty of looking at pictures of the kids when I return home and dwelling in my thoughts about how much I love them. Oh, how I love every single one of those sweet faces. Don’t get me wrong, that’s great, but I can dwell in my love for a long time. But God commands for our love to be an action. He commands that we boldly love to move His Kingdom forward. When the kids in Kè Pou Timoun are all in matching T-shirts with big smiles on their faces, you can forget their tattered clothing underneath, and the tin and twig homes they return to after the program ends every day. You can forget that each night, these kids fall asleep to the sound of Voodoo chants and drums. You can forget that it’s normal for girls to be raped and likely become a mother before the age of 15. You can forget that these kids would be worshipping Voodoo instead of Jesus if it weren’t for LiveBeyond’s ministry. But may we never forget their desperate circumstances, and that God gave us this life to care for and love others. He gave us this life to step in and intervene to give these children, and all of His people, a future filled with hope that only comes through Jesus Christ. Our lives are meant to be lived with His love as an action. Let’s live out love together, friends. Whether you serve as a full-time medical missionary or devote your vacation days to volunteer, we ask you to share your favorite photos online with the hashtag #ACUmissions. Include a sentence or two telling us about the photo and why it is meaningful to you. Or you can email your favorites to Robin Saylor, robin.saylor@acu.edu.